Lingua Custodia was very proud to be selected as one of the few startups to attend the Credit Agricole event dedicated to innovation on 23rd and 24th of June. We had the opportunity to introduce to the senior managers of many Credit Agricole entities the benefits of a personalised translation software to reduce internal time spent on the translation of technical financial documents. While Microsoft, IBM, Oracle and other we presenting their last innovations, Lingua Custodia performed the automatic translation of all Amundi Key Investor information documents during the event to demonstrate the robustness of its technology. 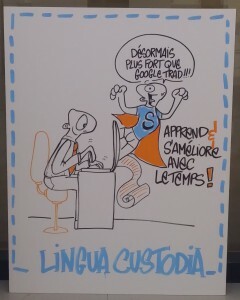 An artist who attended the forum could not resist to caricature our stand (see below) after one of Lingua Custodia Product specialist was interviewed by a local TV channel and the Credit Agricole internal TV crews.